That’s actually a leftover idea from World War 2. The British didn’t want enemy soldiers to learn about their new radar technology, so they claimed their airmen got their night vision by eating carrots! Whether or not the Germans fell for it, the idea stuck around. So, is there any truth to it? Maybe not to the part about superior night vision, but carrots and other foods like the ones below do contain nutrients that help our eyes stay healthy! Fish are the best source of omega-3 fatty acids, which are crucial for brain function and a healthy immune system, but it helps to protect against cataracts, dry eye syndrome and even macular degeneration. One study found that people who ate just one weekly serving of fish, generally a good source of omega-3 fats, cut their risk of macular degeneration by over 30 percent! Studies have shown that the nutrients lutein and zeaxanthin are linked to a lowered risk of chronic eye diseases like cataracts and age-related macular degeneration, and the foods that have the most of these are eggs and leafy greens! Carrots, along with other yellow, orange, or leafy green fruits and veggies, is an excellent source of vitamin A. These types of produce get their colour from beta-carotene. Our intestines use beta-carotene to make vitamin A, which helps our eyes convert light into brainwaves and is an important component of our corneas (the clear part of the front of our eyes). Vitamin A deficiency leaves up to half a million children blind each year! Your eyes are sure to benefit when you add more of these nutritious foods to your diet, but even the healthiest food isn’t a substitute for a regular eye examination! Poor nutrition isn’t the only thing that can cause eye problems, which is why it’s crucial to schedule an appointment with Dr Michael Jackson at Sanctuary Cove Optical especially if you’ve noticed any changes in your vision. The frames are made using fusion of tempered steel and polishing techniques with metallic components coloured via a high tech process to achieve deep and distinctive colour saturation. Perhaps the most striking aspect of a Von Arkel frame is their highly crafted hinge. The patented hinge design was created and refined over a two year period to ensure strength coupled with freedom of movement and has no screws, glue or rivets. Classically beautiful, unfussy and delicately balanced, these superior frames are some of the very best on the market. Each frame is lightweight yet sturdy, and resistant to scratches and marks. Frame finishes include stainless steel, acetate and titanium. Hay fever is the most common form of allergy which affects two in five Australians throughout the Spring and Summer seasons. Mainly affecting the eyes and nose, typical symptoms include sneezing, itchy ears, nose, eyes and throat, a runny or stuffy nose and red, watery eyes. Nasal sprays help reduce the inflammation in the nose which is the cause of nasal blockage and other symptoms. Although hay fever can have a large effect on your day to day life, there is relief available. Taking simple precautions and utilising products available on the market to assist with hay fever symptoms can help limit your discomfort and help you enjoy the most out of every day. If you love the clean and classy ‘Scandi’ look, then you are going to love our collection of beautiful Danish designed Lindberg frames. Lindberg designs have won dozens of prestigious design awards, and are characterised by their classical lines and carefully considered simplicity. Using patented technologies, each frame is individually crafted for visual impact and strength, using materials including titanium, acetate, gold, platinum, diamonds, as well as eye catching natural animal horn. 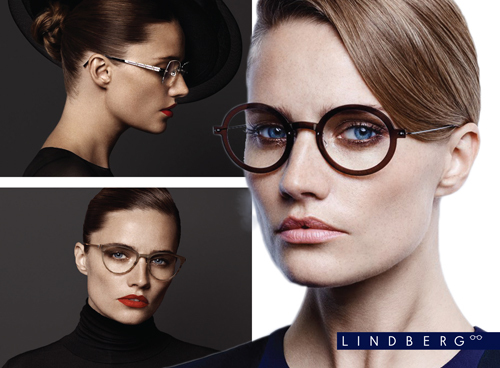 Lindberg frames are engineered rather than made, and have done away with the use of screws, rivets and welds, which makes their frames stronger, more flexible and less prone to breakage. Their frames are ultra-lightweight, ensuring comfort for the wearer. All of our Lindberg frames are made to order direct from Denmark, hand-finished and individually numbered. We usually engrave your phone number on the side of the temple so that they can be returned to you if they get lost. They are truly the Rolls Royce of eyewear today. Dry Eye Syndrome can now be a thing of the past for Gold Coast residents with the arrival of a breakthrough IPL (Intense Pulsed Light) treatment at Sanctuary Cove Optical. “IPL is revolutionising how we manage dry eye syndrome, and is the treatment that eye specialists and sufferers of Dry Eye Syndrome have been waiting for,” said Optometrist, Dr Michael Jackson. “More than 20 per cent of the Australian population will experience Dry Eye Syndrome. The Syndrome manifests as dry, sore and itchy red eyes, with associated poor quality of life and eye function,” he said. “IPL technology uses perfectly calibrated, intense light pulses which stimulate glands within the eye to return to normal function. With just three treatments of three minutes duration, and then periodic top-ups, we now have the opportunity to really nail this debilitating condition,” he said. This technology is non-invasive, pain free, and has no negative side effects. Patients often report an improvement within hours of their first treatment. Dry Eye Syndrome is primarily caused by a dysfunction of the Meibomian gland. There are more than 80 Meibomian glands located in the upper and lower eye lids. These glands produce oil which helps to prevent tear evaporation. People with Dry Eye have an oil layer within their tears that is unstable and thinner than normal. Often it is attributed to increasing age and more commonly affects females than males. In addition to hormonal causes, it can be triggered by windy, dusty dry weather as well as the effects of modern living, with computer screens, driving, artificial light, air conditioning, pollution and contact lenses all recognised contributors to the condition.